A gelatin salad filled with bananas, pinapple and strawberries. 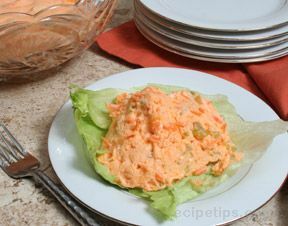 The sour cream makes a fantastic layer that cuts down on the sweetness. Perfect for the holidays. 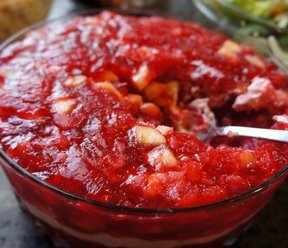 Dissolve jello in hot water; let set until just begins to jell. Add bananas, pineapple and strawberries. Pour 1/2 of the ingredients in 8x12 inch dish. Refrigerate to let jell. Spread sour cream over all. 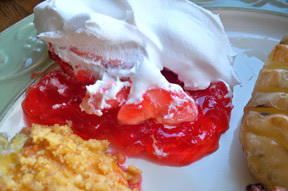 Pour remainder of jello over sour cream. Refrigerate until ready to serve. 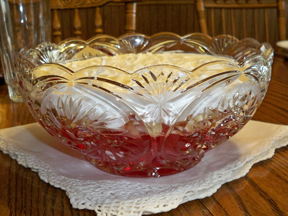 "I brought this to Thanksgiving and came home with a clean bowl. I guess people still eat Jell-O salads."